Jon Haynes is the Water-Use Specialist for the Oregon Water Science Center. After receiving his Bachelor of Science degree in Geology from the University of Oregon in 1995, he worked for the USFS in both the Malheur and Willamette National Forests. In 1999 Jon accepted a position with the USGS at the New Mexico Water Science Center field office in Las Cruces. There he participated in several projects studying the effects of groundwater use in the Mesilla Basin and Hueco Bolson. In 2002 Jon moved back to Oregon where he continued working with the USGS at the Oregon Water Science Center. Jon has worked on many groundwater studies for the Center. His work has included managing project well monitoring networks, archiving groundwater data, building geologic framework and groundwater model components, and everything GIS. Currently Jon is compiling water use for three groundwater studies and is preparing for the 2010 national water-use compilation. Jon is also assisting in the development of a soil water balance model (SOWAT) used to estimate irrigation water use from evapotransporation data. 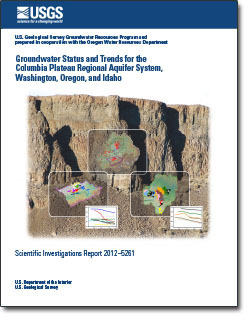 USGS total dissolved gas (TDG) data help guide spill and discharge management from dams operated along tributaries of the Willamette River.